Pros & Cons of Progressive Lenses and Multifocal – WHAT are they? HOW do they work? Now that you know more about presbyopia & progressive lens glasses, it is time to know the pros and cons of progressive lenses. Progressive glasses and multifocal are the same, so the words are interchangeable in this article. Whether progressive lenses are the better alternative for you, you’ll need to look at these favourable circumstances. With progressive lens glasses or multifocal lenses, you don’t need to take them off when changing from doing things, for example, working on a PC whole day, and after work when you go out driving, you face a problem to need to change to ‘driving glasses’. Do you see parents or older people keeping a set of glasses in their car for driving? Common! 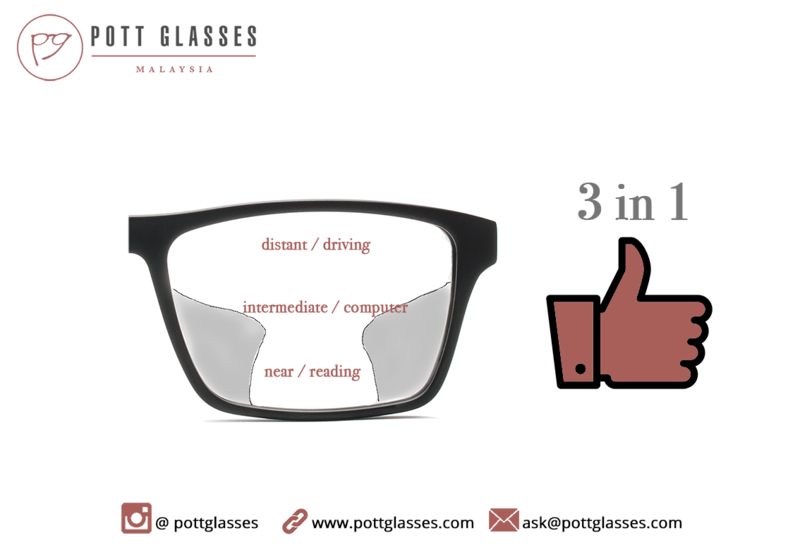 No need 2 pairs of glasses for reading and driving. 1 pair all-in-one glasses is enough. More convenient, get to choose one very stylish pair of progressive lens glasses instead of two. Now you don’t need to bring two glasses out! Start wearing progressive glasses at younger age of 40-45 helps in adaptation. As the age goes up, you may find it harder to learn how to use progressive glasses. Older people like parents keep a pair of glasses in car for driving, now no more with progressive lens glasses! Regardless of the possibility that you work or don’t work on a computer so much, nowadays you still have smartphones. As long as anything with a LCD or LED screen means it can be harmful to your eyes. In this way, you need the one-size-fit-all remedy. Progressive lenses or multifocal lenses can merge all the focal power you need into one single lens, like ordering a pizza with 3 different flavours put into 3 sections. A few issues with progressive lenses happen when using the stairs. Since the lens power for reading correction is at the base, the stairs may appear like they skip a step. Nothing to worry, adjusting to your progressive lenses will take the most two weeks, soon the inconveniences ought to vanish. If for some reason you cannot feel comfortable with progressive lenses, fret not because this is when bifocal lenses are going to be your solution. Not the end of the world. Initial restricted head movement. 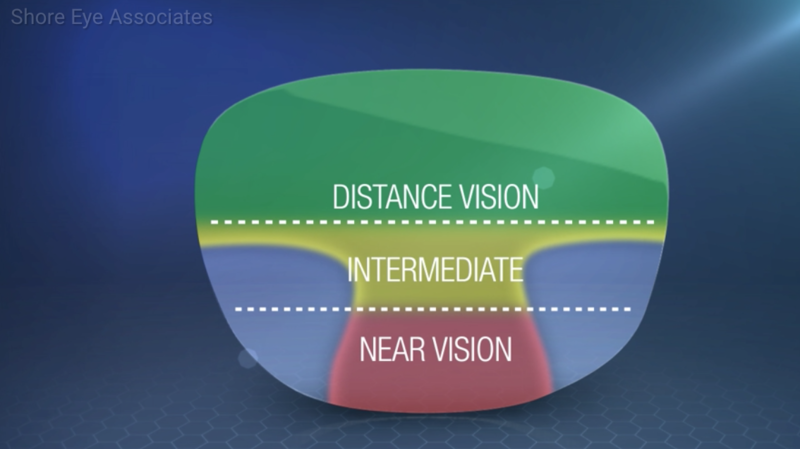 You may need to learn to find the exact focus point for distant, intermediate and near vision. Fret not, once you get used to it, you’ll be fine. After all, optician/optometrist should locate the point according to your habit, allowing these points to naturally fall into your eyes. There is no one perfect glasses. While multifocal helps you to see far and near with just a pair of glasses, you have to bear with the distortion. However, rest assure that the once you are used to the distortion and know how to go around with it, you’ll actually enjoy the vision more than being disturbed by the distortion. When it comes to making decision whether or not to get multifocal (progressive glasses), you may want to see how troublesome it is to bring reading glasses along and how not being able to read clearly affect your daily life. There is also multifocal glasses with less distortion and easier to wear. To find out more about different types of multifocal, read here. You can also make an appointment with us to do an eye test and see if multifocal glasses really help you. We are giving RM50 off when you make an appointment in the form below. This entry was posted in Progressive lenses and tagged multifocal, multifocal glasses, multifocal lenses, progressive lenses.